Missionaries Excursions into Pennsylvania, Varied with Abundant Labors in New York State—Back-Woods Narratives, viz: Extensive Revival on Tioga River and Crooked Creek—Edsall Mitchell, Middlebury, Head-Quarters—Words with Eld. A., an Antinomian—My Deacon’s Sole Missionary Tour—Campbellite General’s Attack and Repulse—Baptism of Mr. Tuttle, Inn-Keeper, Aged Eighty-Five Years—Conversion of Mr. B., of Knoxville—Three Poor Families near or on Pine Creek—Two Females come Through the Thunder-Storm to Hear Preaching—Securing a Preaching Place in Tioga, (Willardsburg)—Relation of Eld. Broakman’s Early Days—Renewal of Baptist Interest in Sullivan: Reynolds: Rockwell—Origin of Bradford Association: Eld. Dimock—Morgan Family—Conversion of Von Puttkammer. Inasmuch as the Saviour gave commission to His disciples to "go into all the world, and preach to Gospel to every creature," I thought I must occupy as much of it as lay in my power. In 1829, I was called into Pennsylvania, to sit with a council to recognize a little church at Middlebury, Tioga county. That, I think, was the first time I had passed the line of New York State. Soon after, I was called to sit in council at Mitchelltown, (near what is now Tioga Village, then known by the name of Willardsburg.) Elders P. D. Gillette and Wise were the other ministers, who, with myself and chosen brethren, were to examine, and, if thought best, ordain, two candidates for the ministry. One of them boasted that he was a great linguist, and my fear was that he knew too much to be very useful. The other knew less, and could murder the English language equal to any other man, yet he was pious and earnest. In view of all the circumstances, and the destitution of the country, we thought best to ordain them. The first individual, so long as I knew him, never amounted to much, but the other has always been doing some good. Those two visits gave me something of a view of the vast destitution of that part of Pennsylvania; but I could not see how I could render them any assistance, for I had already more on my hands than it appeared possible for me to get along with. Bro. Edsall Mitchell, of crooked Creek, (Middlebury church and township,) wrote me a very urgent letter representing the destitution in Tioga county. My heart was pained within me. I did not know what to do. But God, in the plenitude of his mercy and grace, was raising ministers, while we were organizing church. Among those I had baptized in New York State, were a dear young man, named Wadsworth, and his wife. He was an Eastern man, who had enjoyed the advantages of a good New England school and graduated, I believe, at the Musical Academy in Boston. He was indeed one of the sweet singers in Israel—a man of rare talents, and commanding appearance—and my hearty desire and prayer to God was, that he might become a faithful minister of the New Testament. While I was praying, God was working by His Spirit upon his mind. It was always my aim to cultivate a habit of familiarity with all my brethren, and especially where I thought I saw traits befitting a preacher of the Gospel. In conversing with him, one day, he told me, with tears and trembling, the exercises of his mind relative to being enabled to do something more than he had hitherto been able to do for the conversion of souls. I gave him such advice, and such encouragement, as I thought duty under the circumstances. A second pressing letter was received from Brother Mitchell, urging me to go to his house, and he would show me something of the desolation of the land. I said to Bro. Wadsworth—who was in comfortable circumstances—"Now, take your horse, and go with me into Pennsylvania." His inquiry was, "Where are you going?" I told him I did not know, but showed him the last letter I had received from Middlebury. I also said, "I want to preach at Mitchelltown, on the river—then we will steer westward." We stopped and held the meeting on the Tioga River, at evening, and from thence proceeded to Bro. Mitchell’s up Crooked creek. The good man met us at the door, but was so overjoyed and choked with tears that he could scarcely speak. I thought, surely, God must be in this. We had left another appointment, at Mitchelltown, for our return—and two brethren had besought me to preach at Willardsburg also. I gave them the day and the hour, so that they could give notice and obtain a place for preaching in. On the evening we reached Crooked creek, I tried to preach in the school-house. They wished another appointment on my return, at the house of Dea. Keeney, in the evening—and an affirmative answer was given to that request also. The next morning we proceeded, guided somewhat, in this to us unexplored field, by the information we received from the former-named brethren. We were told where we could find one or two Baptist brethren, on Pine creek. There was not much difficulty in obtaining places in which to preach, or people to hear, for it was a new thing to have a minister among them. By the aid of those few brethren, we had as many appointments as I could fill, aided by Bro. Wadsworth’s praying, and talking after sermons. We were able only to approximate the region of real destitution, pressed on every side by the cry, "Come again! Come again!" Returning, we commenced filling our appointments. At Dea. Kenney’s, it was a dark, lowery evening, but the house was filled to its utmost capacity. God appeared in our midst by the power of the Holy Spirit. In vain we strove to dismiss the meeting, for the people seemed unwilling to go away. After a season of prayer and exhortation, one rose up manifesting a hope in the Saviour; another followed, and another, I think four or five in all. We thought we were ready to depart on the morrow, early in the morning; but God’s ways were not our ways. Those individuals, after having been fellowshiped by the few Christians who were present, wished to be baptized. I knew not what to do. The conversions seemed to be sudden, and yet the converts gave signs of a death unto sin and a quickening by the Spirit of God. I felt anxious to get away early in the morning. When my mind was made up to baptize the, I asked Dea. Keeney if he had any pitchpine? If so, I would baptize them that night, for Crooked creek ran but a short distance in front of his house. But the good old man had no torch-wood. It was then after midnight. I gave the people notice that I would preach at day-break, and baptize as near sun-rise as possible. We dismissed the meeting, and I retired to bed to review the scenes of the evening, and prepare for the morning. We made some calls, and gathered fresh information from Bro. Mitchell, then wended our way down to Willardsburg, (now Tioga,) to attend the appointment given out through the two brethren, already referred to. When we reached the little ‘burg, I saw those two friends, standing in the street. We rode up to them, and passed the compliments of the day; but I saw, by the countenance of one especially, that he was much cast down. One of them, at last, remarked, "Eld. Sheardown, you can’t preach here. We have tried every way, to get a place for you to preach in, but we have failed." The other, an aged man, added, "I told you it would be so. The folks in Willardsburg won’t come to hear preaching—and they never ought to have another sermon preached to them." This was a good man, but very stern in his way of expressing himself. The younger—a man with a family—began to weep. I said to him, "God help you, my brother! Don’t weep. Where is the use of crying? I will preach in this ‘burg. Wadsworth, my brother! Rein up your horse here beside mine. If there is nowhere else for me to preach, I will preach sitting on my horse. Then, if the Anakims are likely to overpower us, it will be soon enough for us to flee, and we shall be already mounted." This was opposite the tavern. While I was turning the circumstances in my mind, a gentleman cam up to those brethren, and began conversation. I heard him say, "The man may preach in my barroom, if he pleases." I remarked, "Thank you, sir. I am much better treated than my Master—he was not permitted a place in the inn." We turned our horses under the shed and went into the house. The landlord appeared to be kind and pleasant. But the notice was not spread, so the people did not know what was going on. I remarked, "If we have any persons to meeting, we must ring our own bell. Now, Bro. Wadsworth, sing one of the songs of Zion—something that we can both join in. We sang a piece or two, but none came in to hear. I walked out upon the platform in front of the house—a kind of piazza—without my hat, and commenced singing at the top of my voice, walking to and fro. By-and-by, a little crowd came around, and once in a while I would hear it said, "He is a crazy fellow—he is a crazy fellow!" When I thought perhaps all were gathered that would be drawn to the point, I said to them, "Come in—come in! I am going to preach to you." With this, they all entered; the landlord made it just as comfortable as he could; and I preached from the text, "Jesus Christ, the same yesterday, today, and forever." It was a time when sinners felt, and felt intensely—one was under powerful conviction. Meeting being over, we proceeded two miles or more down the river, where the evening appointment had been left. There we found a different kind of a tavern from the one we had just left. It was a "Baptist tavern," kept by the ancestors of the Mitchell family in that neighborhood. The old gentleman (Richard Mitchell, Sen.,) was without the church at that time, but mother Mitchell clung fast to the wreck. The first "Tioga, Pa.," Church joined the Chemung Association in 1814. It was probably composed of members throughout the country, and held its meetings at different points. In 1822, the name of "Sullivan" appears in the Minutes in the place where "Tioga, Pa.," had stood, with delegates from the vicinity of Sullivan—and the same year, a second "Tioga, Pa." Was received into the Association, with delegates from the vicinity of Tioga. Elisha Booth, an ordained, and David Short, a licensed minister, and Bro. John Main. Elisha Tucker, D.D., was engaged in teaching school in Tioga, and there preached his first sermons, in 1816. But this new organization became scattered. There might have been more than one brother still living in membership, and, perhaps, six or eight sisters. After refreshment, we had a season of prayer, and then went to the old school-house, which looked to me like a palace built for God. In the course of my sermon, I remarked that the waters of Crooked creek empty, above us, into the Tioga River—gave a short sketch of what we had seen, felt and enjoyed, up that creek, the night before, and on the morning of that day---and then observed, that, as the waters of the creek, in which I baptized that morning, flow into the river, so I believed the waters of God’s salvation would flow to that people. A dear sister—the daughter of the good woman to whose house we stopped—lived in the house adjoining the school-house. After meeting, she said to me, "Eld. Sheardown, it looks to me, sir, almost like blasphemy, to talk about God blessing such a wicked people as we are here." We were to tarry all night with her family. After singing and praying, I thought her husband appeared somewhat moved, but not powerfully. We retired at a late hour. We were to start for York State as early as we could get breakfast. The dear brother, who had been weeping in Willardsburg because he could not get a place for me to preach in, came to bid us good-bye. But I remarked to him, "We are not going yet, Bro. Adams. Here are two candidates to be baptized." He inquired, "Who are they?" I answered, "Thomas and his wife." He appeared to be perfectly awe-struck. "Why," said he, "it was only the other day that I saw him drunk." I replied, "I cannot help that. I believe God has converted him; and, if converted publicans and harlots may enter into the kingdom of heaven—why not this man? Now, my brother, I want you to put a boy upon one horse, and send him up the river; and another on your other horse, and send him down the river. Call at ever house, and tell everybody they see that there will be a covenant meeting this morning at nine o’clock, and that Thomas and his wife are to be baptized." The messengers went forth, and the people rallied to see this great sight. At the appointed hour, the school-house was a perfect jam. Weeping and anguish appeared to take hold upon some of the old members who had been excluded for intemperance. (Let me here say, that we acknowledged the few sisters, and Bro. A., as a church, for the women had always maintained their regular covenant meetings.) I talked to those who were desirous to return, as best I could, impressing upon their minds the magnitude of their sins. I told them I felt as though confession only was not enough to satisfy the community in the midst of which they had fallen. I inquired for a temperance pledge. One was brought. I read it over again and again, and said to the brother that was to be baptized (if fellowshiped by the remnant of the church.) "Will you sign this pledge?" He said he would. I then asked the same question to such as had fallen into bad habits and lost their standing in the church. They answered, "Yes." When we had got through that part of the service, I remarked, "Now, before you sign the pledge, and before I can advise this little body to receive or restore you, I wish to pray; and while I pray, I want you to stand, and hold up your right hands as a token, that, by the grace of God, you will not violate this pledge." They were immediately upon their feet, and there was weeping aloud on every hand. After prayer, the pledge was signed, the converts related their experience, and the backsliders were restored upon their confessions. The former were received by the church, and baptized. After some of the best advice and instruction that I was able to give them, the benediction was pronounced, and we started on our journey about one o’clock in the afternoon. The next Sabbath, I was preaching in Reading, New York, within a school-house known as Devins’ school-house, at one of my regular appointments. Before I closed my sermon, I saw in the crowd, Bro. A., from Tioga. The tears were coursing down his cheeks. As soon as I had said, "amen", I added, "Bro. A. tell your story: I know you are after me." He remarked that "the people in Tioga are in a dreadful state of mind; weeping appears to be all that many of them can do; and I want you to go home with me." I said, "Very well, sir, I am ready." He said, "When?" I told him, as soon as I had dismissed my meeting. I was sixteen miles from home, and had another appointment on my way. Arrived at home that night, and the next morning started for Pennsylvania. Arriving at father Mitchell’s on the river, I learned that a minister of another denomination had heard of the moving in the neighborhood, and on Sabbath made an appointment for Monday evening. Some of the people felt rather indignant, because he had been told that a messenger had gone out to York State, and they expected me back with him; and although it was not certain, yet they had every reason to believe that I would be on the ground, Monday night. I told the friends to have no feeling on the subject; we would all go to meeting, and try to do good. We heard a sermon that appeared to be antagonistic to Baptist sentiments and Baptist views, and many thins were alleged, that, as a denomination, we have never believed or practiced. I knew the preacher personally, and he knew me, but he paid no regard to me. That, however, made no difference in my feelings in relation to the well-being of the souls that were gathered around us. He preached a very long sermon, after which he remarked, that, "there may be some one, here, perhaps who would be glad to speak, but we have not the time to spare. I have some other things to say to this congregation, and especially to any that may have been recently converted. I design having an organization here." (That was not his word, yet it implies what he wished to perform.) He told them, if they would do so and so, he could come there and preach to them as often at least as once in three or four weeks. The meeting held to a late hour, and he did all the talking. His last remark amounted to this: "Now, to-night, must determine whether I shall come here any more or not: if there are any who will comply with my wishes, I want you to manifest it by rising up." But none arose. He then came to a very righteous conclusion, by saying, "I perceive I am not wanted here." I stayed with them several days, and had sometimes two meetings in the day, and sometimes only in the evening. The blessed Saviour was pleased to claim the purchase of his blood in the conversion of many souls. I was under the necessity of returning to New York, but left an appointment when I would be there again. I do not recollect whether I baptized any that time or not, and the records of the church in these days are lost, (so I am told by the clerk,) up to the year 1845, so that I am deprived of obtaining the exact dates when and how many were added unto the church. This, however, was the beginning of what is called to this day "the great revival on the Tioga river." The work continued to go on in my large charge in New York State. Yet I saw very clearly that I must devote more time to the field in Pennsylvania than I had yet done. I find, by referring to the records of one of the little bodies where I was preaching, in New York, that they passed a resolution, that "we willingly relinquish our pastor for one-half of his time, to go and labor in the destitute regions of Pennsylvania," (and it is worthy of notice that that little body had claims upon me for only two sermons a month.) This was a great relief to my mind, and there were one or two young brethren who could occupy the ground during my absence. For a length of time, every visit I made into Pennsylvania, I baptized more or less—rising of forty, I think, in Tioga. But I kept Middlebury as my radiating point, and continued to make further inroads into those regions where they had no privileges of a Gospel nature. The father of my Bro. Edsall Mitchell was one of the first settlers in Tioga county; and the whole family (like others of that day) loved to hunt. Being thus extensively acquainted in the woods, he (the son) could conduct me to every settlement, however small. I rode with him a great many hundred miles, and the remembrance of those excursions is very sweet to this day. I owe a great deal to him, for he conducted me sometimes through woods twelve or fourteen miles without a house. A few months ago, I had the privilege of spending some time with him, recapitulating the dealings of God with us. He is now tottering on the brink of the grave, but rejoicing in the hope of the mercy of God. I recollect, one time, I had an appointment at the house of a Bro. Steel, on Pine creek. When I rode up, I saw a little, knurly kind of a man, holding a very fine horse by the bits. The first impression of my mind was that the man had stolen the horse, for I had not seen such a one in all those parts. My congregation was together, with few exceptions, and I was just about to open my meeting, when the man came up to me, reached out his hand, and said, "I suppose I shake hands with Eld. Sheardown," I replied, "I suppose you do, sir." He said, "I am the far-famed Eld. A." The reply was, ‘Some men are famed for their good deeds, and some for their bad ones. Pray tell me, sir, on which of these grounds you fame has extended?" He paused, and acted as though the shot had taken effect; the reply was, "I suppose for my bad deeds." He was answered by my saying, "I suppose, then, sir, the greater part of what I have heard about you, is true. Now, when I am at home, I keep good company; therefore, mean to when I am abroad." He said, "I have been waiting in this place twenty-four hours on purpose to hear you preach." I remarked, "Very well, sir; my business is to preach to sinners." This ended the conversation, and I passed on to my services. I had another meeting in the evening, a short distance from there; he was again present; but, from that day onward, I did not see that he ever spent much time in waiting to hear preaching from me. One of my principal places of speaking, on that part of the creek, was at a tavern kept by one of the kindest, best-hearted men I have ever met with. His wife was a Methodist, and a choice spirit, amiable and kind. Since that time, that dear man has been converted, and is (for anything I know) a living member of the Methodist church. He has served as Sheriff of Tioga county for one or more terms. I never meet him but I receive smiles and tears. In those days, I would generally ring my own bell and make my own appointments, never thinking to ask whether they were desirous to have preaching, but taking it for granted that it was always welcome. I do not recollect, now, that I ever came near being "bluffed off," but once, in all my travels—and that was in the case of Mr. Tuttle, which I will come to presently. Whenever I had evidence that souls were born of God, I baptized the converts, if there was not a Baptist church within fifty miles. Under such circumstances, I gave them a certificate, stating that they were baptized by me, and recommended them to any church of our order. On one occasion, after my return home, while attending covenant meeting in one of the little churches that I had gathered, I was reciting some of the privations and difficulties I met with in these new and sparsely settled regions. While I am pleading with them to spare me a little more time to devote to the poor, hungry souls, that were so willing to received the bread of life, I remarked that no one knew what a minister is exposed to, who travels through the little back places in Pennsylvania. One of the deacons—a right hand man to carry on meetings in my absence—tapped me on the shoulder, and whispered, "Stop, Elder—they won’t believe you." I remarked, "If the friends are incredulous, I wish some would take a tour or two with me, and I think they will not consider the little things that I have named, are exaggerations." He replied, "I should like to go with you." The answer was, "Do, my brother; go, and see, and feel for yourself." He said, "When are you going again?" "In two weeks, if God will." This deacon was a Dutchman and always kept an excellent horse. He concluded, at the appointed time, to explore the field, or part of it. As Providence would have it, it was to be one of my hardest tours, and—being about the middle of March—in about the worst time of all the year. Before I had returned from my last trip, two young men in Tioga county—unconverted men, yet who often traveled many miles to hear me—had said to me, "Now, Elder, we want you to go down to Blackwell’s and Lloyd’s. We are going down there, and, if you will let us take appointments for you, when you come again, we will be at home and go with you." One remarked, "It is a bad ride down there, and we should not like to have you go alone." I gave them the appointments, which were faithfully circulated. This appeared to me to be very timely in order to give my new fellow-laborer a large experience in a little time. The pastor and his deacon started on the trip. The latter looked proudly at his beautiful dappled steed, which had always been fostered in a warm stable with the best of care. He soon began to complain that his horse was losing flesh, but I endeavored to comfort him by saying, "We are not yet fairly in the field." "Entertainment for both man and beast" every day becoming more scarce, instead of a good, comfortable stable, the horses would have to be hitched for the night under some old log shed. We were riding about twenty miles, and I generally preached three sermons, each day. When we had come down off the mountain, wending our way to a certain creek, (the name of which I have now forgotten,) I preached at the house of a man named Braughton. It was agreed at what hour we should start, under the leadership of the two young men. The creek down which we traveled entered into Pine creek but a short distance above Mr. Blackwell’s, where my first appointment was. In passing down this little creek, we had to ford thirteen times in going about nine miles. The fordings were very difficult, for the creek was frozen on both sides, but open in the middle. The deacon was always the last to put his horse in, and I rally was amused, for I though sometimes it was difficult to tell which was the highest—his head or his shoulders. He had evidently got what is generally termed his "back up." But the great struggle had not yet come. When we reached Big Pine creek, our guides declared it impossible to cross at the fording place, it being frozen on either side, and open in the middle, and the boys said, from the depth of water, we could not get out on the other side if we got in. My own experience and observation confirmed the truth of the statement. What must be done? In looking at the situation in which we were placed, I said to the deacon, "If God will, I shall fill my appointments." "How will you get there?" "I shall get there, some way. We can go down to the eddy, and cross afoot on the ice." But the second appointment was in the evening. Now, what must be done with the horses? "Hitch them safe to some saplings, leave them, and let us take it afoot." The boys fell in with the idea. The deacon thought it unsafe to leave horses under such circumstances, without any feet or shelter, as the wolves might come and destroy them. But we were not to leave our animals thus. One of the boys said, "Now, Elder, between here and the Big Eddy, the creek will be open, but it is very swift, and the bottom very rocky, and bad to ford." We rode down to the place spoken of, and found it as described. We concluded to take the ford and try it. It was agreed that I should go first, seeing that my horse was thoroughly trained to such adventures: for fording rivers and creeks, under almost all circumstances, was a part almost of his every day business. I made the passage, though it was very rough and difficult, for my horse, by the strong current of the water, and in winding around the large stones or rocks, had gone down stream a great many rods. When I made the opposite shore, I called to the boys to put in higher up, as it appeared to be less dangerous. After we were all safely landed, one of the pilots found we were on an island—and the danger was not yet passed. The other branch of the stream we must cross, in order to get on the side on which the man lived in whose house our appointment was made. One said he would go down a little way and try the ice. In crossing, his horse broke through with its hind-quarters, and we feared for a second that horse and rider both would be lost. It was open water at the head of the branch, and to my mind it was much better to risk the open water than the treacherous ice. The place where we thought to cross, was not so very wide, but it might be deep; the water being muddy, we could not see the bottom; but the appointment must be filled. I therefore concluded, if the deacon must stay behind, I must in. I got on my knees on the saddle, crossing my feet (as I had often done) just behind the saddle, and put my horse in: he just made the passage, without swimming; the opposite bank was very bold, and, as soon as my horse’s nose touched the bank, I jumped from my saddle, with the bridle in my hand, and, "chirping" to my horse, (as I was wont to do when I wanted him to make his best effort,) he came out all right. The other young man tried it next—then the good deacon—and we were all safe on the bank of deliverance. We had a blessed time at the meeting, without a thought of the dangers and trials through which we had passed. By the time we were ready to return, the stream had fallen some, but still it was March traveling. We succeeded in filling all our appointments, and returned safe at home, after a tour of two weeks or more. The deacon’s horse looked as though he had seen very hard times, and truly he had, for he was not accustomed to "go on a mission." When the Deacon was questioned by the friends relative to the journey—whether he found it as bad as was represented by the Elder—I cannot say what would be his reply, but I dare say that the one-half of it he has never told. Having arrived at home again, the old field must be gone over. The little bodies, unconnected with the church, must be seen, covenant meetings attended, prayer meetings, preaching, and baptizing—for it was a rare thing, in those days, to pass a month without baptizing some. It was a common occurrence, when I reached my house, to hear, as the first item of news, that such a one is converted, and such a one. Frequently, from there to ten were reported, who had been brought into the kingdom in my absence. Sometimes, on arriving home, I would find my wife with four or five young people, having prevailed upon them, after the meeting was out, to come with her, that she might have an opportunity to labor with them. So my own dwelling was the spiritual birth-place of many souls brought to the truth as it is in Jesus. The deacons and other gifted brethren would give me an account of the interest of the meetings at the different points. The home work being done—which would require about two weeks of incessant ministerial labor—then I would take the saddle again for the back-woods. Those were the days when Campbellism was making bad work, not only in the feeble churches, but was seriously affecting the minds of unconverted people. I remember having met a gentleman—for his title was "General"—not far from Wellsboro’, whose wife’s mother was a Baptist. I frequently stopped to refresh with the family, and preached occasionally. The General still lived with his wife’s family, and would always endeavor to get into an argument with me, when there, about baptismal regeneration. But he was very much like Gen. Taylor’s troops in Mexico—he did not know when he was whipped! Having an appointment at his father-in-law’s house, I concluded to talk truth to him: then he would not feel at liberty to answer while I was yet speaking. I had studied my sermon in my saddle, from the Saviour’s words to Nicodemus: "Marvel not that I said unto thee, Ye must be born again." (John 3:7) The day was very rainy, and I was pretty well saturated, having a long ride, the last part of it (about eight miles) through the woods. I cannot say that I had not a dry thread about me, but I was thoroughly wet, from head to foot. When I reached the house, I found the young folks, but the father and mother had gone to York State. The storm was such that I could expect but very few—perhaps a dozen people—at meeting. Had it been fine whether, I should have expected enough, from a distance, to have made quite a congregation. I made up my mind that I should have to take another hand-to-hand combat with the General. But, to my astonishment, the people came through the storm, and filled the room. It is seldom that I have felt more grateful to the God of all my mercies, than I did on that occasion. I preached my sermon, as best I could in my uncomfortable condition of body. As soon as I had said amen, the General arose, and controverted the doctrine which I had advanced. I said little or nothing, but let him talk in peace until he was through, when I remarked, "Now, sir, I have very little reply to make. I have a few questions to ask, and that is all. Since I saw you last, I have learned that you have been baptized, by torch-light." He replied, "Yes, at twelve o’clock at night. "—"Now for a question or two. Do you really believe, that when you were immersed, your sins were all washed away?" The answer was, "I do, sir. "—"After that act, sir, do you now consider yourself in a state of perfection? "—"As far as my sins are concerned, I do, sir. "—"Did that act of baptism place you in an immutable state, so that there is no danger that you will ever sin again—or, in other words, that you are incapable of sinning?" The reply was, "I suppose not, sir. "—"Then you are liable to sin, are you? "—"Yes"—"Do you believe a sinner can enter the kingdom of heaven?" –"No, sir. "—"Now, then, what must you do, in order to be saved from the sins that you may commit after your baptism? "—"I suppose, sir, I should have to be immersed again. "—"Well, sir, after this second immersion, if you should fall away and sin against God—your conscience be smitten that you had done wrong—and, while thus reflecting, by a flash of lightning, or the falling of a tree, or some other casualty, you should be instantly killed; what would become of you? "—"I don’t know, sir—I had not thought of that." I had but one more question to ask, and that was to my congregation. I said to them, "Now, all of you present, whether saint or sinner, who believe that I have preached the truth, and that the last speaker is in error, signify it by rising on your feet." I think there was but one (except myself) who did not rise, and the reader may guess who that was. An unconverted man said to me, one day, "I wish, Elder, you would preach at Knoxville," (on the Cowanesque river). I told him I thought I would get an appointment there, but could not see my way clear to give them a sermon until I should pass through again. I did not always know how many appointments I had to fill, until I arrived at Bro. Mitchell’s on Crooked creek. That was my head-quarters and I had given him encouragement, that, if he saw any person from some remote little settlement, where no minister ever went, I would go there and preach, provided he made the appointment with the understanding that he should pilot the way. But I thought probable that, the next time I was through, I could preach at Knoxville, and therefore made an appointment, for a certain day, at half-past two o’clock in the afternoon. Notice was given out in the school. When the day arrived, a Baptist sister, who was passing through the village, heard of the meeting. She tarried to hear me, and, after sermon, came and shook hands as cordially as if she had always known me. She remarked, "My name is Weeks. I am a Baptist. Where do you preach to-night, sir?" I replied that I had no appointment that night, but had one for the forenoon of the next day, in Mixtown, or what was often called New Hector. She at once said, "You must preach for us, to-night." I inquired, "How far do you live from here?" She said, about six miles. I remarked, "Why, that would be useless—your neighbors could not get the word, and I, perhaps, should have no persons to preach to." She replied, "Yes, you will have persons to preach to. To be sure, we are very scattered, but I am on horseback, and I will publish it to every house as I go up the river, and I know who to tell to go and notify their neightbors; and when I get home, I will start the boys out, to let all my neighbors know that there is to be preaching to-night. Now, I want you to understand that the preaching is not to be at my house. When we have any person who comes there to preach, they always preach at Mr. Tuttle’s. You cannot miss his house, sir—it is right on your road, up the river—a very large house, with red gable ends, and the front white. It is a public house, and has a large sign up—‘Entertainment.’ You will most likely meet with the old gentleman; you may know him as soon as you see him, for he is palsied on one side. His wife is a very excellent woman—but he himself is very crabbed and cross—and, if he should abuse you some, you must not pay attention to that. I shall call and tell him of the appointment, so that you may not be quite a stranger to him; but do not feel bad, sir, if he scolds considerably." Having received this information, and the good woman having gone homeward with permission to ring this bell for me, I got my horse, rode along as directed, came to the house, dismounted, and went into the bar-room. There was the old gentleman, evidently armed and equipped to meet me. I said to him, "My name is Sheardown. Mrs. Weeks said she would make an appointment for me to preach, here, to-night, sir. "—"No, sir," said he, "you ain’t agoing to preach here. I wont encourage you lazy vagabonds, running around getting your living out of the poor folks, professing to be preachers." I replied, "I shall preach here. Have you a hostler, sir?"—"No!" he said, "not for such lazy fellows as you." I said to him, "Well, sir, if you have no hostler, tell me where I shall put my horse." He replied, "I tell you, you shan’t stay. "—"I tell you, I shall; and if you will not tell me where to put my horse, I will put him in the best place I can find. "—"Then," he said, "take him across the road, and put him into yonder long barn." I took him to the tier of stables, found some good hay overhead, and let him go to eating. Going back to the house, I said to the old gentleman, "Now, sir, I am a good hand at waiting upon myself. Please tell me where I can find some oats. I want six quarts for my horse. "—"We haven’t got any," he said. The reply was, "I know you have got plenty." He retorted, "But you shall not have them." I replied, "I will have them. Your sign says to the traveling public, ‘Entertainment for man and beast,’ and if you do not let me have the oats, I will pull your sign down." He exclaimed, with a word that I am not at liberty to use, "Take my keys, unlock such a bin on the stoop, and take what you want." I got my six quarts of oats, at the same time telling him that I always intended to pay my way. After returning from the barn, and conversing with Mr. Tuttle a short time, he appeared to be a little softer. I asked, "Have you no women around the house? I want something to eat." He replied, "Very well—go into such a room, and you will find the old woman—tell her what you want." I found the lady. She appeared like a mother indeed. The moment she knew who I was, she anticipated my wants, and brought on mince pie and other good things to meet the necessities of the hungry body. I ate hastily, for the time of my appointment was near at hand. I preached that evening to quite a congregation, and felt the presence of the Lord very precious. The people appeared to be over-awed. I had another appointment soon, at the same place, when everything appeared to go off smoothly. The old gentleman was good-natured, and ready and willing to let me and my horse have all that was necessary for our comfort, without fee or reward. Some time afterwards, in making a tour over the mountains with my pilot, we found it very bad traveling, it being about the middle of March. There was much snow and ice in our paths. I said to Brother Mitchell, "We must make the best of it. I want to go down in the valley before school closes for the day in Knoxville, as I have no appointment for the night, and will preach there—it will be easier getting a congregation." And I added, "Now, we must not stop at father Tuttle’s—for we were to pass his door, and if we stopped we should be detained so long that I could not be able to get my appointment circulated. However, both of us complained of our feet being cold, and concluded we had better stop ten or fifteen minutes, see how the old gentleman was, and warm our feet. We had but just dismounted, when a son of the landlord came up to us, with an overcoat, and a whip in his hand, apparently fixed to leave home. I addressed him as "Brother Tuttle"—for he was a Methodist class-leader, and I think an excellent man—and inquired, "Where now—where are you going, sir?" The tears came to his eyes as he replied,--"To York State; I was going to see if I could find you." Seeing that he was so much affected, I thought perhaps the old gentleman was dead. He said something about his father, which his choking with heart-feeling prevented our understanding. But he immediately took our horses, led them to the bar, and said, "Go in." We entered the house, and found the old lady, and a little grand-daughter, I think, with her. She raised her hands, and in her way began to praise God, and weep; and the girl, sympathizing with her, wept too. Bro. Mitchell said, "What is the matter, mother Tuttle? What are you all crying about to-day?" She tried to tell, but I was not yet able to understand what was the cause of the apparent sorrow. The son returned from the barn, saying, "O, there is a God in this—there is a God in this!" We had not yet taken off our over-garments, because my motto was, onward to Knoxville! He said, "Sit down, brethren, and I will tell you all about it. My father," he continued, "is converted. He has had a very severe attack of sickness, and is still quite unwell. He had desired me to go to York State, find Eld. Sheardown, and, if possible, have him come home with me, for he felt as though he must be baptized before he died. Now, you must stay and preach with us to-night, and we will see how things will turn out." I still plead that I ought to go on, but he overpowered me with his argument. I thought, Who am I that I should resist God? So I concluded to stay and preach, and he sent off the runners to give general notice of the meeting in the evening at his father’s. I said I should like to see father Tuttle. His wife and son, Bro. Mitchell, and myself, went into his room. He was in bed, but looked up and exclaimed, "It’s him! It’s him!" He got hold of my hand, and wept like a child. He said something like this to his son: "There, now, I feel better; I want to get up; I want to talk with Eld. Sheardown." We left the room, and they got the old gentleman into his large arm chair. I conversed with him to see what evidence I could get that God had wrought a work of grace in his heart. He gave large evidence that he was dead to sin and alive to God. I asked him if he thought he would be able, after sermon, to talk to us, and tell us how the Lord had dealt with him, especially since the first time I had preached at his house. His reply was, "Yes, I want to tell all about it." There was a very general turning out in the evening, and after sermon I remarked, "Mr. Tuttle thinks he has experienced religion, and is going to tell us something about his feelings—how he felt, and how he now feels." The old gentleman had some two or three times of commencing, for something would strike his mind, relative to his change, that he had not named before. He said he must tell everything; he not want to keep anything back. A death-like stillness prevailed through the congregation. After he had got through, I said, "If it is God’s will, I shall baptize father Tuttle, early in the morning." I spoke after this fashion: "Now, in the first place, I want to say to every individual present, who professes religion, whose hope is based upon repentance toward God, and faith in the Lord Jesus Christ, if you can receive the experience of this aged man, believing that he is converted—born again—rise on your feet." What few Christians were present, to an individual, arose. I then said to his pious son, (who was a man in the meridian of life,) "Can you personally feel to fellowship your father as a Christian?" He almost wept aloud, and said, "Yes." I then said to all present, "I do not care who you are, what you are, or how wicked you may have been: if you think that Mr. Tuttle is a Christian man, rise up on your feet. They all arose. I was preparing to dismiss the meeting, (for it appeared that I had nothing more to say, except to give out the morning services,) when the old man broke out and said, "Don’t go away yet; don’t go away yet; I have not done confessing to my neighbors." And such a flood of confessions the old gentleman poured out, as is seldom heard. I then gave my appointment for the morning: at daylight, preaching, and after the sermon, we were to repair to the river, which ran but twenty or thirty rods in the rear of the old gentleman’s house, for baptism. In the morning, at the time of appointment, the house was crowded. When all was ready to repair to the Jordan, the first thing to be considered was, how we should get the old gentleman down. It was proposed to carry him in his arm chair. We had plenty of power, for there were a number of strong, athletic men, who were anxious and willing to do what they could. They fixed a piece of board or scantling underneath the chair, the bearers on either side, and some walking behind, steadying the sedan, until we arrived on the bank of the stream. After he was set down, he said, "Carry me under that buttonwood tree." They took him up, and carried him just where he wanted to be. "There," he said. "Here is the spot. When I knew not what to do with myself, I crawled down here; here I prayed, here I felt happy, and right there," pointing into the river, "I prayed that Elder Sheardown might baptize me." He was a very corpulent, heavy man. I do not know his age, but it was said by some that he was eighty-four; others said he was eighty-six, but I did not ask any of the family his age. After singing and prayer, I said to the congregation, "You all see the difficulty that I am in. It is impossible for me to get this palsied man in and out of the river, alone. Now, who will go into the river with me, and, when I am ready, assist in this solemn business?" "I will," was responded all around me. But his son spoke out, "I will go in with the Elder and my father." I inquired something about the depth of the water, for the river was roily, and I did not know how the bar lay. Every individual appeared to be interested; one said, "It is so deep there, Elder;" and another said, "It is so deep there," and pointed it out. I told them what depth of water I wanted, and the place was designated by throwing a stone where they thought I should have the depth of water I desired. I went into the river, explored it, found the place I needed, and came out. Next, we got the old gentleman out of his chair, and I gold his son how we must handle him, how we must get him in and out of the water, &c. I told him when I said, "I baptize thee," (for that was always my last word, bringing the word and action together)—then he must let loose of his father; but, the moment he saw his face coming to the top of the water, he should take hold of him with me, raise him up on his feet, and hold him perfectly steady. But the good brother, instead of obeying me, obeyed the impulse of his own warm heart; for, when he ought to have had hold of his father, he was clapping his hands, crying, "Glory to God! My soul is happy." But I was able to raise the old gentleman on his feet, and steady him a second or two, until the dear son got hold of him. We locked him in our arms; he stepped with one foot, and dragged the other after him; we got him safe back into his chair, and in carrying him to the house he said to the men, "Set me down, set me down; I can walk—I know I can walk." They said, "No, you can’t walk." I said, "Give him that cane; he can walk; set him down." I suppose it was the action of the cold water on his palsied system, that might last him to the house, and it did; but many published it as a great miracle. This was the last I saw of father Tuttle. He died some time after this, (I do not know just how long;) his son told me that he died in hope of eternal life. My face was now turned towards home, filling my appointments, in Southern New York, bordering on my mission field in Pennsylvania. Arriving at home, I as usual began to gather up the fragments, so that nothing might be lost. The brethren had enjoyed good season throughout that field of labor. I seldom spent two weeks at home but I had more or less to baptize, some things to set in order at the different stations, my working brethren and sisters to encourage, and lay out new labor for them while I should be absent on my next missionary tour; and I had brethren and sisters who would word with a will, some who never faltered. Having straightened up the ship at home, and got her fairly on her course; I was ready again to depart for another wilderness campaign. Riding through a neighborhood in Tioga county, six or eight miles from Knoxville, I was hailed by a man at whose house I had stopped once or twice by invitation. If there can be anything good in an unconverted man, who believed in annihilation, he possessed that quality, for he was very sociable and benevolent. He invited me to dine with him, and fed my horse, that I might be better prepared to go on my way. He asked me if I was going to Knoxville? I replied, "No, sir." –"Now," said he, "I wish you would let me make an appointment for you there, because there is one individual in that village, who is a very wealthy man, but one of the queerest, wickedest men you ever saw. I thought that if I should go down there and have a talk with him, and tell him that I am going to make an appointment for Eld. Sheardown, a particular friend of mine, he will come to meeting. He never goes" (I believe he said) "to any meeting; but, if he can get a minister into trouble in any way; it affords him a great deal of satisfaction. One day," he said, "Rev. Mr. C. called at his store, and said, ‘Mr. B. I want to see your wife.’—‘Very well,’ he replied, ‘she’s a pretty woman, and I will go to the house with you.’ He took the minister around, seated him in a cozy little room, and asked him if he had read the news? Mr. C. replied he had not, ‘but,’ said Mr. B., ‘I have got the paper in my pocket; here, sir, you take and read it until Mrs. B. comes in.’ He went out at another door, for there were two doors to the room; one he went in at from the street, and the other led into the interior of the house. Mr. C. commenced reading, and waited more than an hour; becoming tired, he thought he would go and look up the lady; but, behold! The inner door was fast; he thought that some trick must have been played upon him, at which he took umbrage, walked out at the door he came in at, and went off, without seeing the lady. The secret was, Mr. B., when he went out, locked the door, put the key in his pocket, and never told his wife that a gentleman was waiting to have an interview with her.—Now I thought, sir," said the Esquire, "I can induce Mr. B. to come and hear you preach. I will go down with you, and use my best endeavors to prevail upon him to come out and hear you." I told him to take his own course; he might make an appointment for a given day in the distance, at half-past two o’clock in the afternoon, and I would make it in my way to take dinner with him, and we would go down in company. I made my connection at an early dinner hour. The Esquire was very fast to inform me that the appointment had been well circulated, and that Mr. B. had promised to come and hear me preach. He said his women folks were going down with him, and he wanted one of the young men should ride my horse and I ride in the double wagon with him and his family. Any way suited me, therefore I piled in with the family. He left us at the place of the appointment, and I did not see him again for some time. He came just as the congregation had about got together and said, "Mr. B. wont be here; he is in one of his tantrums; I never saw him in a worse." I said to him, "He will be here, sir, I believe, and I wish I knew him personally, but I do not know that I have ever seen him. Now, sir, when he comes in, (for I believe he will,) I wish you would just draw your fore-finger across your brow, so that I may know him." He smiled and said, "Very well." Mr. B. came in during prayer. When I commenced reading my hymn, I saw Esq. C. give the sign; he turned his eyes partly over his shoulder; behind him sat a tall, gaunt-looking gentleman, his hair standing every way like the quills of a porcupine. My anxiety to know the man, was, that I might see whether I could gain his attention or not. After meeting, his wife very kindly invited me home with her. I consented to go; she took me through the bar-room, and there was Mr. B. She introduced me; he started back a pace or two, and said, "Why, this is the man who preached to us." I said, "Yes sir"—"Well, wife," said he, "you take care of him; you are the woman for ministers." She was a Baptist sister, of exalted piety. One of Mr. B.’s peculiarities was that he always, in choosing a wife, (for this was his third,) looked out for a pious woman. The evening passed along; I saw nothing of Mr. B.; he was not in to tea; but I should think about seven o’clock, he came into the sitting-room, running his fingers through his hair, and paced the room backward and forward several times without saying a word. He then went out, and after a while came in again, smoking a pipe. I remarked to him, "Mr. B., it looks quite sociable to see you smoking." He replied, "Would you like to smoke with me? "—"I would, sir, if you please." He said to one of the children, "Go and get some clean pipes, and some of that best tobacco." He sat down, and I thought that he had taken, (in some measure,) the bait. I remarked to him, "Your saw-mills on Pine Creek are about in running order again." (This was after what is termed the great May flood, when mills as well as other property had been very much damaged). He said to me, "What do you know about my mills on Pine Creek?" I told him I was very well acquainted there; that I stopped and preached to the hands, sometimes, when I was passing by, when it was not likely to interfere with their labor; and went on to inquire after some other mills that he had on different streams. "Why, how the -----" (I like to have said devil, but I won’t say it,) "do you, as a minister, know so much about saw-mills?" I told him I always calculated to notice everything that I passed, and gather some information as I went along, and that some of my best preaching places were among such establishments. I found he was becoming quite tame. He said, "I am not known by the name of B. I pass, both in the country and in the city, by the title of the Lounger of the West." He then endeavored to entertain me with a lengthy anecdote relative to a scene through which he passed in the city of New York. "At such a time," he said, "I was down to the city, buying goods. I bought some of my goods at the firm of a father and son; the father was very aged, but the son was a real business man, in the vigor of life; they were the most religious people, sir, you ever saw. I bought a great many goods of them; we always had a very good understanding. The son said to me, after I had made my purchase, "Now, sir, I should be very happy to have you take tea at my house this afternoon, at such an hour.’ I replied, ‘I cannot do that, sir; I am here, you see, as the Lounger of the West, with my cow-hide boots on, and everything else in proportion, and I am not fit to go into company, especially if there are to be ladies present.’ He told me that it would be a little family te ta tee; in the course of the evening there might perhaps be a friend or two dropping in, but no one whom I need be troubled about. I finally promised him I would go. Them, the first thing was to get shaved, the old boots blacked, coat brushed, and rig everything in the best style under the circumstances. To my utter astonishment, after tea, we were shown into another apartment, (a very beautiful, elegant room;) soon after, gentlemen and ladies began to drop in, and the first thing I knew I was in the midst of a cotillion party. Of course, I must figure with the rest, and a pretty figure I was. After all was over, I was waited on to my room for the night. It had then got to be twelve or one o’clock. I had not been long in my room before I heard this pious gentleman praying. I thought to myself, good Lord, these people could not pray when I was up! How very pious they must be." After he was through with his relation, I said to him, "Mr. B. I have learned two things, sir, from your anecdote. The first is, you do not think much of people who keep you up till twelve or one o’clock at night at a cotillion party; the next is, sir, that you have no confidence in those who pray after you have gone to bed. Now, sir, I am in the habit of praying every night, when I go to bed, certainly, either before or after I retire. "—"Why, would you like to pray now? "—"Just as you please, sir; but I shall certainly pray to-night, and I should like you to have a good opinion of my Christianity. "—"Daughter," said he, to a lovely child, "fetch in some more candles. Now, maybe the man would like to read. "—"I should, sir, if it is your pleasure. "—"Bring your mother’s big Bible." While this was doing, I looked at my watch, and said, "It is very near twelve o’clock." I read a portion of Scripture, kneeled down, and prayed, after which I said I would retire. He took a candle and waited on me to my room. He said, "There, sir, this is the best bed and room I have got in my house. I hope you will enjoy it. Pleasant dreams to you, sir; good night." On my pillow, I reviewed the scene, from the time Esq. C. had solicited an appointment from me, with the understanding that he was to go and get this gentleman out to meeting. I believed that God was in this movement, but how, I could not tell. I was always in the habit of rising early in the morning, and I found that they did the same. We had an early breakfast. After breakfast, I commenced conversation again in reference to large tracts of wild land that he owned, after which I said to him, "I should like, sir, to look over your establishment here. I have about an hour that I can spare. I was brought up, in early life, to business, and it always does me good to see a prosperous man. He replied, "I shall be very happy to show you what little we have here." He went on speaking of some conveniences about his house, the tavern where he lived, then took me to the store, from there (I think) to the tannery, and from there led me along to an old building in the mouth of a little ravine; at once he stopped suddenly, and said, "I won’t take you any further this way; this is rather a bad concern; that building," he said, "is my still-house; it came very near being carried away by the freshet, and I wish it had." He said, " It is poor business; I think I shall never work it again. Now," said he, " I must show you the grist mill." He took me into the grist mill, through every nook and corner, until I was almost covered with cobwebs and flour dust. Every once in a while, he would give the meal a brush off me with his hand, but (as his hand was always very mealy) he left me in a worse plight than I was before. Yet he was always very careful to say, "I am sorry, sir, that you are getting so much of this white upon your clothes." I told him it made no difference to me, as I was used to the rough and tumble of life, and if it was not white it was just as likely to be black, from helping some poor man who might be trying to get a black brand on to his log-heap—for I never rode by a man, and saw him in trouble in getting a log up on his heap, but that I jumped from my horse and assisted him what I could. "Why," said he, "you are a queer fellow. I never met with just such a one before." After I had gone through, I said, "Now, sir, I will have my horse, and pay my bill. Have you got a boy around that will saddle and bridle my horse? "—"Yes, I will do that." We went to the stable, and found my horse in as fine trim as though he had come out of the hands of a perfect groom. He saddled and bridled my horse, and brought him out. I asked him how large my bill was? He said, "Nothing at all, nothing at all." After I had got into my saddle, he said to me, "Ah, now you must dismount, and go back with me into the house." I went back with him; he took me into the bar-room, unlocked the bar, went to his decanters, first taking out one stopple and then another, smelling of the contents, finally took a bottle and glass, and set them down, stood a moment, put them back and came and took a seat by me, and commenced conversation again. I thought then, and I think now, his great object in this maneuver was to get me to drink something, but he was afraid to ask me. I then walked out to my horse at the post, and got into my saddle. He said to me, "Now, sir, whenever you come this way, make my house your home. The best I have shall be at your service." I said to him, "Mr. B., I am very much obliged to you. And now, sir, I expect you are hones in what you say, and I accept your invitation. But there are some things about this, that perhaps I should do well to name. It is reported, far and near, that Mr. B. is the most profane man there is in this country, and is in the habit of getting into what the people call ‘tantrums.’ Now, sir, if I should call upon you, and you should be in your business, I shall not come and interfere with you, for the sake of seeing you, for men never wish to be interrupted when they are crowded with business matters; and I don’t want, sir, that you should ever come where I am when you are in those tantrums. I profess not only to be a Christian, and a Christian minister, but a gentleman, and when I call at your house, sir, if you can step aside from your business, I shall expect to have your company, and that we shall try to be sociable and do each other good. My great object is to benefit the children of men. Now, sir, I have said this to you in the honesty of my heart, and I hope we shall often meet to enjoy season of conversation to-gether. "—"Go on, sir, go on; you are the queerest fellow I ever saw in my life." The next time I staid all night there, he and his wife were away from home. I was well cared for, and in the morning asked the young man for my bill. "O," said he, "father told us, if ever Eld. Sheardown came here, and he was not at home, to let him have the best the house afforded, and never charge anything." I thanked him, talked with him a moment or two, and went on my way. The next time I was there, he was at home, and I had a very pleasant time. He said to me, with tears in his eyes, "Now, sir, if you will come and live in this village, I will find you a good house to live in, and see that you lack for nothing, and I will build you a church in the corner of my orchard there—that beautiful place—that shall cost three thousand dollars. I will enter into bonds that shall be perfectly satisfactory to you, to do all that I have said." I told him my calling was of such a nature that I could not settle anywhere. Things were assuming such features, in York State, that it was necessary for me to curtail my labors in Pennsylvania. The next I heard of Mr. B., a man rode up to my own door, soon after daylight, with a jaded horse, which looked as though he might have been going all night. I invited the man in, and called one of the boys to take his horse. He said he had come, on express from Mr. B.’s, for me to return with him with all speed; that Mr. B. was very sick, and the probability was that he could not live. I questioned the man in relation to how he was taken, what was the matter, what the physician said about him, how long he had been sick, with a great many other inquiries. From the man’s account, I gathered the idea in my own mind that his sickness would not be unto the death of the body, for everything indicated that he was under the greatest distress of mind for his sins. I told that man that I could not go; that I had other engagements that I must fulfill, and that I could not save Mr. B’s life. "But you return home, as soon as you can, and say from me to Mr. B., that no earthly power can do him good; there is but the one Physician, and that is Jesus Christ. Tell Mr. B. to commit himself, soul and body, for time and eternity, into the hands of the Saviour, and he will be, well enough. For some years, I heard nothing from Mr. B. One day in 1854, my senior Deacon, who had heard me speak in reference to the gentleman, and knew something of my anxiety to know his condition, said to me, "Your old friend, Mr. B., is living in Elmira. Would you not like to go down and see him?" I said, "Yes, indeed, I would." He replied, "Tomorrow morning I will take you down there. I am acquainted with him. He is a very different man, now, from what he was when you first knew him/" We made the call, and found him at home. He was a good deal haggard with the toils and cares of a long and arduous business life, but I had scarcely entered the room before he recognized me, and embraced me with the greatest rapture. After we had talked a few minutes, he said, "I want to pray. Let us all kneel down and pray together." The scene was what I can not describe; the feelings of my heart no human tongue can tell. This was the last interview I had with Mr. B. How different from the first! I hope and trust he now is in heaven. I had been traveling some in Potter county, Pennsylvania. When I came to a school-house, if there was school, I would arrange with the scholars, at noon, to run around and give notice to a few of the nearest neighbors, who, with the children, would make up quite a congregation, and I would try and preach to them Jesus and the resurrection. Then I would inquire the course in which there was another school-house, and, if it was in my reach before school was dismissed, would get out an evening appointment, then find somebody with whom I could stay all night. Thus pushing around from place to place, I finally crossed the line into Tioga county, and preached in a settlement where I had spoken a few times before. There I met with two or three Baptists. After the meeting was out, a man came up, shook hands with me, and called me by name. I had to look pretty close, for all the light we had through the service was from a few slivers of fat pine, inserted in the jams of the old fashioned log-house fire-place. He asked me if I would not go home and stay all night with him. I told him I preferred not going any further, if I could stay where I was; but he insisted that I should go with him. I asked him the distance. He said not over a mile. His wife was in company with him, and I concluded that if she could walk that distance through the pitch darkness, I certainly could ride. They were both irreligious. I talked with them, prayed with them, and endeavored to point them again to the Lamb of God that taketh away the sins of the world. I had preached to them in York State. They appeared to be among the very poor, but what they had was free as water. My horse faired a great deal worse than myself, but he said nothing, had no fault to find, for he had learned, no doubt, that the mission field was often very scarce of provender. In conversation with the man, early in the morning, after having eaten a very light breakfast indeed, we talked about the way to Phoenix Run. He wanted to know how far from Pine Creek. I told him, as near as I could guess. "Well, now," he said, "Elder, you are a pretty good back-woodsman, and if you can keep the course through the woods as I will give it to you, you will strike the Run at the foot of Round mountain." I thought that there were so many mountains, and round ones too, that it was not a very definite direction. He said it was only eight miles through the woods, but there was no path, not even marked trees, by which I could be guided. He pointed out the direction, where the wind was, and said, if I kept the wind so and so, I would no doubt come out right. I concluded to try it, inasmuch as it was going to shorten, very greatly, my travel. Having got perhaps two miles into the deep wilderness, my horse made signs that there was something around that he did not like very well, for he was always afraid of wild animals. While talking to him, I heard the brush crack. My horse jumped, and I looked around, but saw nothing. Very soon, I heard it crack again, and though perhaps it might be a panther drawing his heavy carcass along; but, in a little opening to the right, I saw a man, and he saw me, and as we approached each other I hailed him by his given name, "Oliver! What are you doing here, my brother?" He was a young man whom I had baptized, with a number of others, some time before, on Pine Creek. I asked him where he was steering to? He said, "To the creek. "—"Where do you calculate to strike Phoenix Run?" He replied, "At Round mountain." I asked, "Why do you call it Round mountain? "—"O," he said, "the people have names for almost all these mountains." I asked him if he had ever been through this piece of woods before? He said, "Yes, once." I remarked, "I think you are bearing too much to the right, otherwise the wind has changed." He said he thought he was pretty near right, but would not be sure; and as we kept talking and moving on, he added, if we are right, we shall come to a house, pretty soon. I said I had never heard of a house anywhere in that part. While we were talking, "There," said he, "I see the break, now, in the woods." We soon came to what back-woodsman call a "slash fence;" there might have been, perhaps, an acre, the timber of which had been cut down, and left on the ground just as it fell. As we could not get through this slash fence, we consulted which was the best way to get around it, and had just started to work our way, when I saw some children. They must have been playing at hide-and-seek, for those that saw us began to shout and scream, and very soon I saw three or four more little ones crawl out of a very large hollow bass-wood tree that had been cut down but was lying up on other timber. I saw at once that they were not all children of one mother. While we were talking and amusing ourselves with the children, we arrived pretty near to the house. There did not appear to be a vestige of anything growing, but what had sprung up wild from the bosom of nature. I said to the brother with me, "Hold on, I want to stop at this house." I went up to a rude door that was partly open, and knocked, but no answer. I always had one question to ask first, when I called at an isolated dwelling, and that was, "Where is your spring?" I opened the door, and asked the question. There were two women in the house; one answered, "The spring’s down by that hemlock tree; the gourd shell is there, sir." I then told them my name, and that I was a Baptist minister; I asked them if they knew the course I should have to take to strike Phoenix Run, near the Round mountain. They told me that I was on a pretty direct course. All this time, I was surveying their habitation. I asked them how long they had lived there? They replied, "over nine years." I asked them where they were from? They said they were from York State. I asked them from what part of York State, but got no answer. I asked them what county? No answer. What town? All silent. I then concluded that, very probably, they were like several others whom I had met with, in isolated places, who had left York State for a cause. I asked them if they had a Bible? They said, "No". A Testament? "No, sir." Why, what books have you? "Not any." Have you not an Almanac? "No, we have not any books." I talked to them some in relation to the interests of their souls. They were intelligent; looked tidy in their persons, their garments well patched. I put it down that those females had seen better days. They had but one room. The floor appeared to be made of split chestnut; chamber floor, they had none; chairs, and tables, were not there. I saw a small quantity of crockery, more or less broken. They had no chimney; the logs had long been burned out where the fire was wont to be built, and a very large slab-stone, standing edgewise, served for a fire-back. There were some small pieces of venison hanging in a little smoke. Blocks, like shingle-blocks, appeared to be their seats. Their bedsteads (one on either side of the room) were very rude, but convenient; they had bored into the logs with a two-inch auger, and inserted cross-pieces, which were put into a hole of the same size, in what might be termed the bed-posts. One difference I observed, between the bed-posts of civilization and those that were on the borders, was, that while we have but two posts on a side, theirs appeared to have three, with the head part some inches higher than the foot. On the cross-pieces appeared to be laid slabs or boards, (I could not say which.) I inquired for their husbands. They said they were out hunting. I would have given them my Bible, but it was the only one I had with me, and it would have very difficult for me to have made my way home without a Bible. My companion left me soon after we arrived on the Run, and I continued my course. Judging my horse by myself, I knew he must be very hungry. I was passing a little log cabin, something like seven miles from the settlement below, where I calculated to take my dinner. I was somewhat acquainted with the people living in the cabin; they were pious, good people, but very poor. I saw, amongst the boys laying around the house, some very nice fresh grass, which I did not see on the mountain, for it was now about the middle of May. I thought I would ask the privilege of turning my horse loose there a short time. I inquired of two children if their father and mother were in. One said no, the other said yes. While I was speaking, the good woman came to the door, very glad to see me. I told her that I wanted to let my horse pick a little of that grass, and I would stop ten or fifteen minutes. She asked me what time of day it was; I told her, about eleven o’clock. She said, "Now, Elder, you must stop and take dinner with us." I told her she must excuse me, for I must go on, very soon;(and I knew that, if I stopped to eat, I should "eat the children’s bread.") But she was so importunate, that the thought struck me, if I do not stay, she will think that it is on account of their poverty; so I concluded to tarry. She said to two little boys, "Run down to the creek, and catch some trout." They were gone but a short time, and returned with a good string of trout. I saw her dress them, nicely, and put them into an old-fashioned frying-pan, minus butter, lard, or anything of the kind. She baked them in her pan, and put them on her table. She said, "Now, Elder, I cannot give you what I have not got; this is all we have, eatable." I sat down with her, asked a blessing, and we partook of the fish. It was, indeed, a "fish dinner." She remarked, "We should not have been so badly off, had it not been that my husband went down the river, and he is detained at tide-water. We expected him back some three weeks ago, and are looking for him every day. You must not be discouraged, and not call again, because we have so little." My heart was deeply moved, and my eyes could not refrain from weeping. We kneeled down and prayed, and if ever I felt humbled in view of the many excuses that had been made around my own table, when we were abundantly supplied with the necessaries of life, it was on this occasion. I left that house, I thought, a better man than I was when I entered it. Proceeding on my way, I reached my appointment in the evening, seven or eight miles below. On another occasion, not many miles from that place, I had an engagement where there were a saw-mill or two, and three log-houses. Preaching was to be in the afternoon. I had about eighteen miles to ride, at ten o’clock, A.M. My first offset was through a piece of woods, perhaps eight miles. I had not been in the woods long, before I heard it thunder. It was evident that it would be a shower of some magnitude, and, from the way it appeared to be coming up, I knew I could not escape. I rode through the whole of it, and the shower was traveling the same direction that I was. Arrived at my appointment in due time. My congregation, of course, was but small, but I had all that were around the establishment. They remarked, "The shower has been very heavy, sir." I said, "Yes." They said, "You must be very wet, indeed." "I am, but I am used to it." When we were together, I sang and prayed, preparatory to my sermon. After prayer, I saw that, during that part of my service, my congregation was increased by two females, apparently as much drenched with rain as I was. After service, I went into the adjoining room, (it was a double log house,) because there was a little fire there. When I entered, I found those two females standing by the fire. I said to one, "You had to come through the rain?" "Yes," she replied. "Ain’t you sorry that you came to meeting?" She replied, "No sir, for I have not heard a sermon, until now, since I left York State. "—"How long ago is that? "—"Three years, sir." The other one, added, "Nor I, either; the last sermon I heard, was preached in York State. "—"How long ago, madam? "—"Over five years." My heart began to grow tender. I was sorry I had not given them more of the bread of life. After conversing with them a short time in relation to the interests of their souls, they remarked, almost simultaneously, "We heard of this meeting by accident; a man was passing through, and, among other things, he told about a meeting being here, and we concluded to come." I inquired, "Where did you come from—from what part? "—"From a little, new settlement, above, sir." I said, I did not know there was a settlement anywhere above. One remarked, "It is about seven miles—seven miles, sir." "You came down on foot, did you? "—"O yes," was the reply, "and through the thunder storm." One said, "It was very severe, sir. When we got out to the clearing here, there were thirteen dry trees, burning on the side of the mountain; they had been struck by lightning." I said to them, "You will not return, I suppose, until morning?" One looked me in the face, and, the tears brimming upon her eyelids, said, "We must go back, to-night, sir: we have left our babies at home." That broke my heart, (and why should it not, as long as a parent’s heart was beating within my own bosom?) I said to them, "Why, it is now five o’clock; you cannot reach your home before dark, can you? "—"Yes, sir, we shall get home, if all is well. "—"I care nothing about it," said the other, "if we can only get through Wolf’s Hole before night sets in." I parted with them, never to see them again. But such thirst for the waters of life, as was manifested by those friends, ought to put to shame thousands of professing Christians, who live within sight and sound of God’s sanctuary, who, if it is not just so pleasant, and just so convenient, appear to opiate their consciences, and make up their minds that they are not called upon to go out to serve God under such unfavorable circumstances! My face was very soon turned homeward, taking Middlebury and Tioga churches on my way. This was a time of great interest with the latter body. My mind was much exercised as it regarded a common centre for that dear church, now largely increased by a group of precious converts. Its original location was Mitchell’s Settlement, two or three miles below the village. Naturally, where a church is first established, there is an attachment to the locality, which some who live in the immediate vicinity feel reluctant to give up. It is like moving the ancient land-marks. My judgment was, that, for the church to grow, it must eventually have its rallying point in Tioga village, and for that I had thought, prayed, and labored. But whenever it was remotely hinted at, that Tioga would one day become the common centre, you could very clearly see that it disconcerted the older members. An empty house in the village I caused to be obtained for preaching, thinking that finally the members’ minds might be turned so that it would appear to them duty, there to erect the banner of the cross. I do not say too much, (and the older Christians will sustain me in the assertion,) that the village was the hardest place to obtain a congregation; anywhere in that part of the country. Not that I mean to say they were sinners above all; but they had formed habits of Sabbath desecration; there was no charm in the Gospel to them; and Jesus was as a root out of dry ground. It was very difficult, at my first outset, to obtain a place to speak in. But one gentleman, whom I have always highly esteemed for his kindness, said to me, if I would preach in his wood-shop, he would have the upper part of it cleared out, and he thought it would make a comfortable place for meetings. I said to Mr. C., the owner of the shop, "It is a great favor, sir, for which I am grateful, to God and to you." My first effort in my new meeting house was very scantily attended. The next thing that absorbed my mind, was, how shall I get a congregation? I hit upon this plan. Perhaps some of my brethren may think that there was too much of the human hand in it, but thus it was: I was preaching up the river from Tioga, down the river, and up Crooked creek, and my arrangement was for a simultaneous rally from those places, where I had good congregations, thinking perhaps I might provoke the people in the village to good works. I said to my friends in those localities, "Next Sabbath, at one o’clock, God willing, I shall preach in Mr. C.’s wood-shop, in Tioga. And now, can not a number of you, young friends, get up your teams, with as many as you can, and come into that place as near one o’clock as possible?" When the time arrived, I was on the look-out. I saw the dust rising a short distance down the river, and up the river, and up Crooked creek. They were driving like Jehu, showing their zeal for the Lord of hosts by their fast driving. They rounded to at the place appointed. Many of the people wondered what was the matter. The result was, I had a very large congregation, and from that day to this, whenever I have preached in that village, (which has been frequently) I could never say that I wanted for hearers. This church, since the days referred to, has passed through a variety of changes. They had the elements of a strong church—members, wealth and position; but the greater part were located near the old hive. After some time, they agreed, I believe mutually, to build a house of worship in the village. It is well located, and adapted to the size of the village. And had they only remained united among themselves, they might have been the most prosperous church in any of these northern counties. But, alas! It has not been so. Difficulties of one kind or another would arise, and many became alienated in feeling. I thought, sometimes, they would become moral cannibals, against whom Paul warns the Corinthians: "For, if ye bite and devour one another, take heed that ye are not consumed one of another." But I bless God, that, amidst all their changes, there have always been a faithful few who would hold on to the promises. They have had a great many pastors, some prudent, and some I fear imprudent. Still, by the grace of God, they continue to this day, and I think in a better state than they have been for many years. My anxiety for this church and community has been very great. And how could it be otherwise? Here was the first door that opened to me in this State, and here God was pleased to give me a large portion of the richest sheaves I ever gathered for Him. In that first revival, while God was bringing in many of the more influential part of the community, there was one—a tall, lank-looking lad—who professed to be converted, but who was rough, and unprepossessing in appearance as could be imagined. When we were hearing experiences, he told his, but there was an unwillingness on the part of some of the church, to receive him. Eld. Gillette had come from Elmira to aid me. I described to him the circumstances, and said, "Now, my brother, what shall I do? I believe the boy is converted, but I doubt whether the church will receive him. He wants to be baptized, and I am desirous to baptize him." He replied, it would not be exactly orthodox. But I would baptize him. I talked with some of the leading brethren, and told them what I should do. They remarked, it would be far better if all could be agreed. It appeared to me that they scarcely could help being agreed—that there could be nothing in the way to a just cause. He was received, and baptized. The poor young brother afterwards went to work in a lumber bush, and had one leg broken, but was kindly cared for by a dear family in that region. I have walked in sight of that young man these many years. Religion appeared to do everything for him, soul and body. 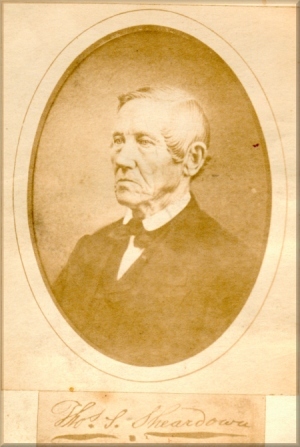 He began to work at the carpenter’s trade, and became a master mechanic—also a good English scholar (although a German)—taught school—was tried about his duty to preach—was licensed by the church in Tioga—manifested considerable adaptation to the work of the ministry—and was finally ordained, in Catlin, Chemung county, January 15th, 1851. I think, under the circumstances, he has become a good minister of Jesus Christ. He surmounted many difficulties, and remains to this day a brother (to me) much beloved. That was no other individual than the present Eld. S. M. Broakman. Another circumstance, not far from this time, occurred, to me of some interest. Having gathered together one evening at the old school-house on the bank of the river in Mitchelltown, I saw in my congregation a brother and sister I had known between the Lakes. The man was a Methodist, and his wife was a Baptist, of talent, and piety. In our conference meeting, after sermon, she arose and spoke through her tears with great earnestness, beseeching the people to spare the minister to go up into their neighborhood and preach for them. The brother, after she had got through, made some appalling references to the destitution and moral condition of the place. It appeared that there was a Baptist church, so called, but the pastor was a whiskey drinker, and believed that every day was alike; consequently, his children were often employed on the Sabbath, laboring, while the father was preaching. She concluded that they could not go home unless they had an appointment to take. I finally said to her, "My sister, have your kettle boiled, your tea-table set; and, precisely at sundown, I will, through Divine Providence, be at your house (on such a day.) Have my appointment for early candle-light." I had in company with me a young man who was studying for the ministry, and who kept an account of my appointments, when and where. He remarked to me, "You can’t do it, Elder; we shall be in Potter county, the night before." The reply was: "I know that, my brother. But, if the Lord permits me, I shall fill my appointment as committed to those friends." When the morning of the day came, I knew that it was not far from fifty-four miles to the place of my destination in the evening. We took a very early start; there was some snow on the ground, and we were on runners. We made pretty good time, until we got into the township of Middlebury, where the snow left us, and the hubs were pretty sharp, but we made out to arrive at Bro. E. Mitchell’s. I told him I wanted dinner, or something to eat, and my horse fed, as soon as he was in a condition to eat. I added, "Now, Bro. Mitchell, can you lend me a saddle and bridle? I must be at Bro. Reynold’s, at sun-down, this afternoon." I said that I would leave, in exchange for the saddle and bridle, my cutter, harness, and Bro. Smith. I got on my faithful old pacer, and (as we generally say) "put him through." Just as the sun was dropping below the foot of the horizon, I arrived at the place of meeting, and found everything, that could be desired, ready for myself and horse. It is seldom the missionary meets with a better home than was found there. I preached that evening to a very large congregation, in Bro. Reynold’s house, and made appointments, after sermon, for the next day. My impression is that I preached four sermons that day, (I know I preached three) on the subject of faith and repentance. My sermon in the evening was at the same house where I preached the night before. It was a time of great breaking down. There were some present from the former named (would-be Baptist) church. They felt very intensely. One brother arose and said that he had been excluded for paying (I think it was) two-and-sixpence to the Tract Society; another said he had been excluded for joining a Temperance pledge or society; and so on. It was very evident that God was doing his own work by his own appointed agency in that place. I left another appointment, but, before leaving in the morning, I said to Bro. Reynolds, "Now, my dear brother, God is going to begin a good work among you, and I feel an assurance, that, if I live to come back, I shall find some precious souls converted. Amongst them, I shall expect to find your dear little daughter. And now, my brother, if she is converted, it would be pleasant for her to go with you; but I expect, if soundly converted, she will want to be a Baptist. Do not stand in her way, but let her take her own course, and God will bless you both." His heart appeared to be broken, his head a fountain of water, and his eyes filled with tears, as he replied, "I have never asked God where my children should go, or into what church; but I have asked Him, a great many times, that He would convert them." We parted, I trust, well filled with the Spirit. When I returned to fill my appointment, I heard, before I was well out of my saddle, from the lips of Sister Reynolds, (for she came into the door yard to meet me,) "Our daughter is converted, we hope," and such a one, and such a one. After the evening service, we heard the relation of their Christian experience, received the statements of some of the brethren who had been excluded, (to whom I have before referred) and formed a kind of church nucleus, (I think we called it a conference.) In the morning I was to baptize. It was very cold, the streams hard frozen, and water near by was rather scarce. I got up early, and said to Bro. Reynolds, "Now, where can we baptize those candidates? The ice will have to be cut, and necessary preparations made." He said, "It is all done, sir. I have been and done it myself." That truly bespoke the character of the man. From that little gathering, I believe, the foundation of the Gray’s Valley Baptist church, (in East Sullivan,) Tioga county, was laid. There was a Bro. Myron Rockwell, who had trials about preaching. He identified himself, I believe, with this little body, and a son of the brother at whose house I preached, I believe had been baptized between the Lakes. Eld. Rockwell has preached for them a great deal, and the young Bro. Reynolds for years has been a consistent Deacon of the church. The church on what is called the State Road, might be termed an offshoot from that in Gray’s Valley. It was still impressed on my mind that my labors in Pennsylvania must very soon, in a great measure, come to an end, and I hoped the young man whom I have before referred to (then traveling with me) would answer to fill my place in that mission field. He had no cares, but just himself and horse, (which, by-the-by, was a very good one) and in this respect all appeared to be favorable. He was ordained in one of my churches in York State, in the town of Reading. He entered upon his work, and I thought was pretty well broken in for a young man. But, some way, he failed for want of adaptation to the field; when the rough and tumble was left to him alone, he did not appear to be equal to the emergency. I would not imply by this that he might not be adapted to other fields of labor. During those years, Campbellism, with its baptismal regeneration, was flooding Northern Pennsylvania, and the billows were making a desperate effort to run over into Southern New York. In 1830, I think, it made its appearance as far north as Trumansburg, between the Lakes. There was an old organization, called the Chemung Baptist Association, which became a perfect wreck of Campbellism and Antinomianism. The churches in Bradford county, and part of Tioga, Pennsylvania, appeared to suffer most, and indeed all of them have not yet got entirely over those days of adversity and alienation. Bro. Gillette exerted his influence to save the remnant of the churches along the border, by finding a home in the Seneca Association, in York State. I remember Rev. D. M. Root, from Troy, in Bradford county, and brethren from Middlebury and Tioga in Tioga county, from Wellsburg on the Chemung, and from other places, sought an asylum in the same Association. When the storms of error had in some measure passed over, the churches in Bradford county (with some from Tioga) rallied and formed the Bradford Association, about 1835. I believe I was present at its first annual meeting, which was held in Columbia township, Bradford county, in a school-house on what was called "Baptist Hill," not far from the present house of the Columbia and Wells church. The venerable Davis Dimock, of Montrose, Susquehanna county, was present, and was chosen Moderator of the Association. Bro. E. Mitchell, of Middlebury, had a connection living there, whom he desired to see, and invited me to accompany him. The Moderator was anxious that a sermon should be preached on Foreign Missions, and that a collection should be taken for same. But it appeared there was no one ready or willing to preach on that subject. Bro. Mitchell arose and said he had with him a ministering brother, who, he thought, would preach, if invited. Eld. Dimock shook his head, and remarked, that error was prevailing so much, he wished one of their own brethren would preach the sermon. He being in the chair—though not a member of the Association—and a man of extensive influence and known reputation, his words had great weight. However, no individual was found ready to preach on the occasion. Bro. Mitchell again urged that the stranger with him should be invited. I thought, "Why should not Eld. Dimock, the chairman, preach it himself?" and proposed the thing. But that was waived, and I was asked some questions relative to my views of missions. I said little in answer, but remarked that I hoped, if I should preach anything heterodox on the subject, the Moderator would be kind enough to stop me, and I would willingly desist and thank him for his honesty. I received the invitation, and preached from Psalms, 72d chapter, 8th verse: "He shall have dominion also from sea to sea, and from the river unto the ends of the earth." The collection, I think, amounted to a little over six dollars. It being their first effort, they felt much gratified at what they had done. The Moderator kindly and affectionately gave me his hand, saying "This is the doctrine, my brother, which we want preached throughout all this region of country." I thought the Association parted under very encouraging circumstances, and hoped and prayed that their benevolence might grow with their growth, and strengthen with their strength. I have lived to see the day when that desire and prayer are in a great measure answered. Another reminiscence of by-gone years puts my mind in connection with one I had known across the Atlantic. When referring to my difficulty on coming to this country without a church letter, I stated that there was a brother, residing in Philadelphia, who was formerly in church fellowship with me in the old country. I was almost as familiar, with his children, as with my own. In 1830, or thereabouts I was much surprised by a gentleman and lady riding up to my door. Whom should she be but the daughter of my dear Bro. Bernard? She had married a gentleman called Col. A. C. Morgan. She had heard of me, and came to meet us again face to face. He had bought a large tract of wild land, and gone into the lumbering business at Lindley, near the State line. They gave me a very pressing invitation to visit them with my wife, and preach. In the course of time, a door opened, and for the first time, on that part of the waters of the Tioga river, I endeavored to speak for God. Col. Morgan was a gentleman of superior business talent, but was an unconverted man. When passing up and down, making my tours into Pennsylvania, it was often convenient for me to call and try to pay my way in preaching. My heart was much moved in relation to the place. I received a line from Mrs. Morgan, stating, in language the most encouraging, her hope that her dear husband was converted to God. I was going up the river very soon, when we had a pleasant interview. I left an appointment to preach on my return, when God was pleased in the multitude of His mercies to pour out His Spirit, and a number were hopefully converted. Things looked, to human observation, to be very fair for the growth of a comfortable little church. There was living with Col. Morgan, a German—a talented young man, of superior education—but his mind very dark as it regarded the plan of salvation. He had supposed he was all right, and safe for eternity, because the priest had made him a Christian when he was a little baby. However, it soon became evident that he was in trouble about his soul. I shall never forget the time when I took him by the arm, as we wended our way to the bank of that beautiful stream. Sitting on a fallen buttonwood tree, I endeavored to open unto him the way of eternal life through faith in the Lord Jesus Christ. He professed faith in Him. After some time, he left the employ of Bro. Morgan, and fell into the hands of another pious family. He soon became anxiously desirous to do something for the salvation of others, and would try to distribute tracts or anything in his power. But God appeared to have a duty for him, and to preach the Gospel became like a fire in all his bones. He became a member of the Lindley and Lawrenceville Baptist church. I had lost track of him for some years, when I heard that he was preaching to a German congregation in the city of Rochester. It was reported that he was the son of a German prince, and was exiled from his home and his country in consequence of having placed his affections upon a young lady in whose veins did not run royal blood. I did not have this from himself, for I never pried into his secret affairs, and he always appeared to be very reserved when conversing about his home and the events of his younger days. The next I heard from him was that he was the pastor of the German Baptist church in the city of Albany. But I have been informed that the same brother (Alexander Von Puttkammer) has since honorably served as Colonel of the 11th New York Battery in the Union contest against the Rebels..